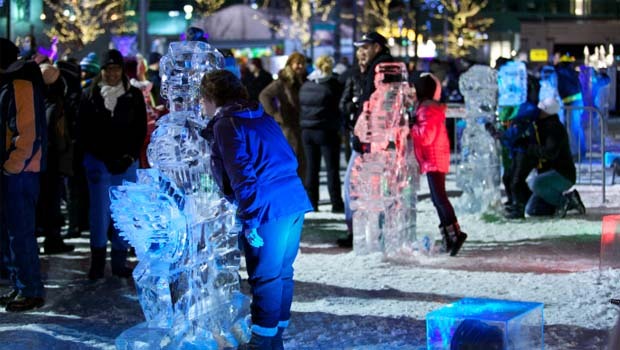 Winter Festivals Metro Detroit 2019 – Celebrate Michigan winter family fun with winter fests all throughout Oakland County and Metro Detroit MI. Winterfests highlight outdoor winter fun with sledding, ice-skating, food and more! There is no shortage of things to do at the 2018 Metro Detroit Winter Festivals. All research and formatting for this Winter Festivals Metro Detroit 2019 page provided by Oakland County Moms. Unauthorized duplication of this content without express consent is a violation of our Terms and Conditions and Data Security policies. Violators will be reported to Google Support for infringement violation of our hard work and research. Enjoy ice carving competitions, live entertainment, wintertime festival food, interactive ice sculptures, rail jams, skiers and snowboarders demos, 100-ft tubing run and much more! Hours are Friday from 5p-10p, Saturday from 10a-10p and Sunday from 10a-6p. Check out plymouthicefestival.com for more info. Fire and Ice Fest provides free family fun in Downtown Rochester. Hosted by the Rochester DDA. Events include fireworks, TasteFest, tube sledding, snow shoeing and cross country skiing, dog sled rides, ice skating, ice sculptures and more! Fire and Ice Festival schedule of events. Fire and Ice Festival Hours are from 5p-9p on Friday, 10a-9p on Saturday and 11a-4p on Sunday. Motown Winter Blast has expanded to 4 weekends with all of your favorite activities – including recurring activities such as ice skating, ice sculptures, marshmallow roasting, food trucks, family activities and live music, as well as rotating activities including Boyne City Slopes, The Winter Slide, zip lining down Cadillac Square, carnival rides, and the opportunity to skate for free all weekend long at Campus Martius Park. SEE SCHEDULE FOR DETAILS HAPPENING THIS WEEKEND AND HOURS. Admission to Motown Winter Blast Weekends is FREE. For more info. Visit the Motown Winterblast website or call 313-963-8418. Activities include – live entertainment, crafts, a magic show, ice sculpture demonstration with photo ops, stilt walker, archery target shooting, penguin bowling, winter scavenger hunt, kiddie sledding (weather dependent), ice skating (weather dependent), and more. Warm beverages and pizza will be on hand while supplies last. FREE parking at Shuttle located at Paint Creek Cider Mill (4480 Orion Rd, Rochester, Michigan 48306, 248 656-3400). ALL PARKING IS AT PAINT CREEK CIDER MILL. This is a FREE event. Sponsored by Oakland Twp Parks and Rec. Call 248-651-7810 for details. Live animal show, hot cocoa station, snowman building contest, crafts, ice sculpture photo station, showshoeing (snowshoes provided). Event will be held rain or shine, snow or no snow! Pre-Registration required. 4 time slots to choose from. Open to residents AND non residents. Cost is $6 residents / $8 non-residents. Enjoy indoor activities & outdoor fun for kids at the Oak Park Community Center. Sleigh rides, hay rides, a bonfire, facepainting and more! Call 248-691-7555 for info. Friday from noon-6p, Saturday from noon-4p, and Sunday from noon-3p. Dozens of ice sculptures to check out in Downtown Mt Clemens in the vicinity of Macomb Place, Cherry Street Mall, Walnut and New Streets. Live ice carving demoes and more. Take a break and warm up at the Indoor Kids Wonderland Warming Center featuring Princess & friends meet & greet, lifesize Candy Land game, crafts, hot chocolate, popcorn, and more. For more info, visit downtownmountclemens.com. Enjoy a winter petting zoo, carnival games, ice sculptures, turkey bowling, and more at Berkley Winterfest. Presented by Berkley Parks and Recreation. Winter Family Fun Day is FREE! This is now a pop-up event meaning the Village of Beverly Hills will announce 2019 dates in advance “weather permitting”. Activities include – sledding, ice skating, cross country skiing, warm drinks, a snow cave, winter golf, winter softball and snacks in the pavilion by the fire. Stay tuned for dates and details here. Enjoy hot chocolate, ice-skating, winter kayak sledding and more (weather permitting). Hosted by Milford Township. Hosted by the White Lake Citizens League Winter Carnival. The annual winter festival has fireworks, a broomball tournament, kids activities, and more. More info…schedule of events. Enjoy food, outdoor games, music, skating, petting zoo, horse-drawn carriage, marshmallow roasting, ice skating and more! A Winter Carnival Hockey Classic follows the event For more info, visit clarkparkdetroit.com. Fun includes games, crafts, free ice skating, marshmallow roasting, horse-drawn carriage rides, snowshoeing, dog sledding demoes, and more! Refreshments available for purchase. This is a FREE event. For more information, contact Southfield Parks & Recreation at 248-796-4620 or visit www.cityofsouthfield.com. More Winter Festivals Metro Detroit 2019 info coming soon!